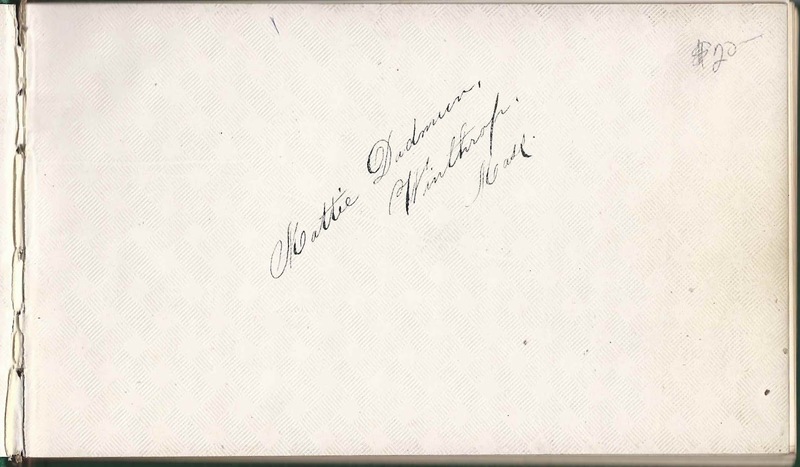 1873 autograph album that belonged to Marthaett Dadmun, "Mattie", daughter of Rev. John W. Dadmun, who was then the chaplain at Deer Island in the harbor of Boston, Massachusetts, where institutions dealing with health, corrections and charity were located. The gut between the mainland of Winthrop, Massachusetts, and Deer Island was filled in naturally as a result of severe beach erosion caused by the New England Hurricane of 1938. Since that time, Deer Island has no longer been an island. 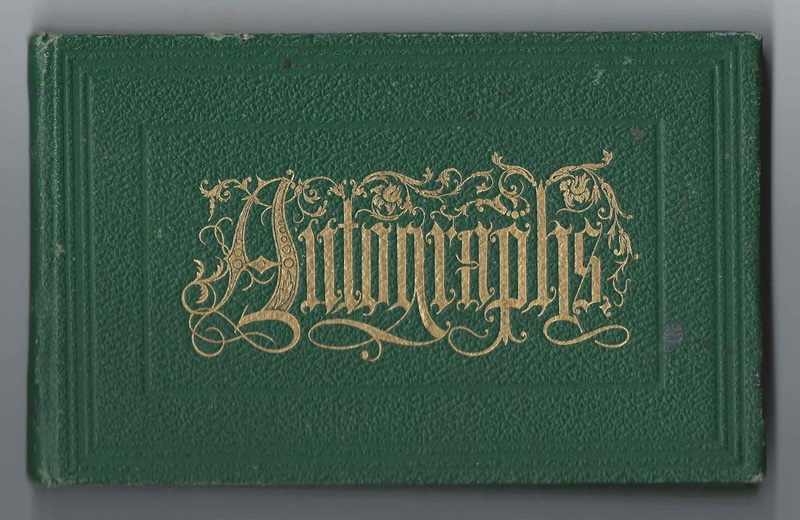 The album is approximately 7" x 4-1/4" and contains the sentiments of 28 people, most of them associated with the institutions at Deer Island. Marthaett Dadmun was born 19 January 1846 at South Hadley, Massachusetts, the daughter of Rev. John W. and Martha Jane (Rogers) Dadmun, who were born at Hubbardston, Massachusetts, and Southampton, Massachusetts respectively. Rev. John W. Dadmun ministered to several churches around Massachusetts before becoming chaplain at Deer Island. See his photograph and biography at a Masons site. On 8 August 1876 at Winthrop, Massachusetts, Marthaett Dadmun married Lewis Bradford Noyes, son of Maine natives Stillman, Jr., and Hester Amelia (Hyde) Noyes. Lewis was born at Dorchester, Massachusetts. He became president of the T. H. Wheeler Company at Boston, Massachusetts. Lewis and Mattie had a daughter, Francena Louise Noyes, born 10 June 1885 at Boston, Massachusetts. Mattie died in 1923. Deer Island Superintendent Guy Carlton Underwood, his wife and sons all signed pages in the album. Newly appointed to his position, Supt. 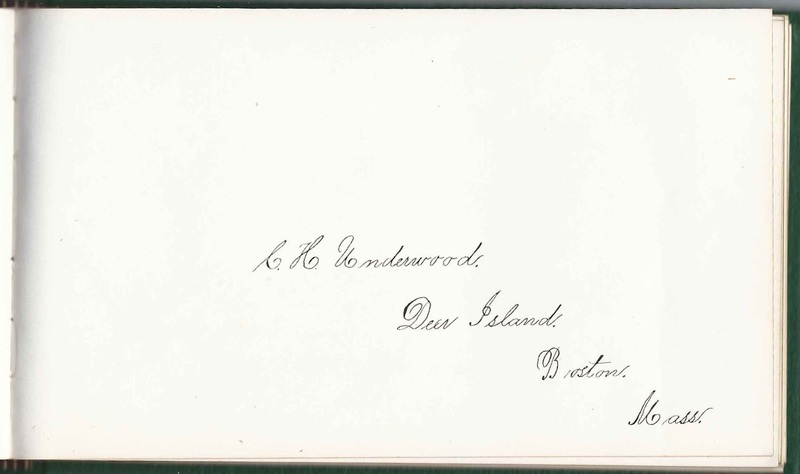 Underwood signed a page on April 28, 1873. Supt. 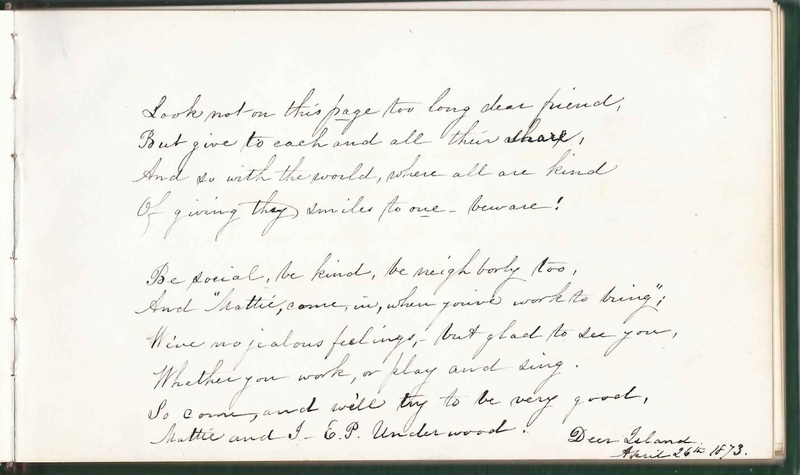 Underwood's wife, Elnora Prescott Connell Underwood signed a page on April 26, 1873. 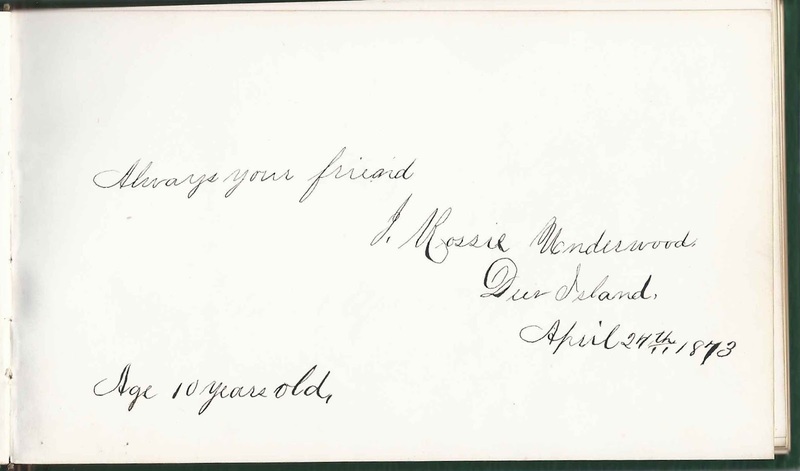 Their son Joseph Rawson Underwood, who called himself J. Mossie Underwood, signed a page on April 24, 1873, at age 10.
? - Blackstone, signed on October 4, 1873 at D.I., presumably Deer Island, off Winthrop, Massachusetts. I wonder if this page was signed by the owner or an employee of the Blackstone Supply Company which provided Deer Island with necessities. 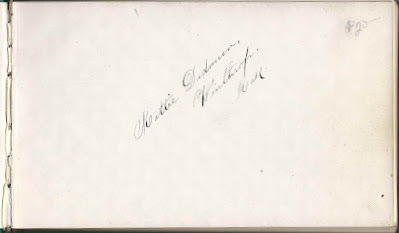 Susie C. Bailey of Dresden Hills, Maine, signed at Deer Island, off Winthrop, Massachusetts, on April 20, 1873. She was a matron at Deer Island. Laura A. Bartlett of Claremont, New Hampshire, signed on May 2, 1873. Future wife of Dr. William George Kimball, Port Physician at Deer Island. Mary A. Bulkley of Philadelphia, Pennsylvania, signed on May 13, 1873. Mary (Asenable) Bulkley, mother of signer W. Alexander Bulkley. Her husband W. Alex Bulkley was a Corrections Administrator in Philadelphia and at one time Supt. of the House of Refuge. Perhaps he served at Deer Island at one point or visited there with his family. W. Alex Bulkley of Philadelphia, Pennsylvania, signed May 13, 1873; Either W. Alexander Bulkley, Corrections Official in Philadelphia, or his son of the same name. Georgie A. Candage, signed at Deer Island, off Winthrop, Massachusetts, on May 20, 1873. She was a teacher at Deer Island. Luther G. Chandler, M.D., signed at Deer Island, off Winthrop, Massachusetts, on April 20, 1873. He was the resident physician at the House of Industry on Deer Island. 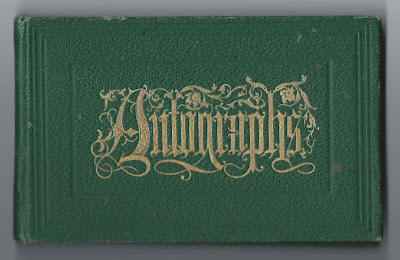 S. H. Durgin, M.D., signed at Deer Island, off Winthrop, Massachusetts, on April 20, 1873. He was the Port Physician at Deer Island. C. Irving Fisher, M.D., signed at Deer Island, off Winthrop, Massachusetts, on April 20, 1873. Port Physician at Deer Island. Lewis B. Noyes, signed at Boston, Massachusetts, on July 12, 1874. He was Lewis Bradford Noyes, future husband of album owner Marthaett Dadmun. M. J. Perkins of Nobleboro, Maine, signed at Deer Island, off Winthrop, Massachusetts, on April 19. 1873. He was Moses J. Perkins, a teacher at Deer Island. Nellie P. Taylor of Boston, Massachusetts, signed on May 15, 1873. She was a matron at Deer Island, off Winthrop, Massachusetts. Guy C. Underwood, signed at Deer Island, off Winthrop, Massachusetts, on April 28, 1873. Guy Carlton Underwood was appointed in 1873 the Superintendent of the House of Industry on Deer Island, in Boston Harbor. His wife Elnora Prescott Connell Underwood signed the right facing page. 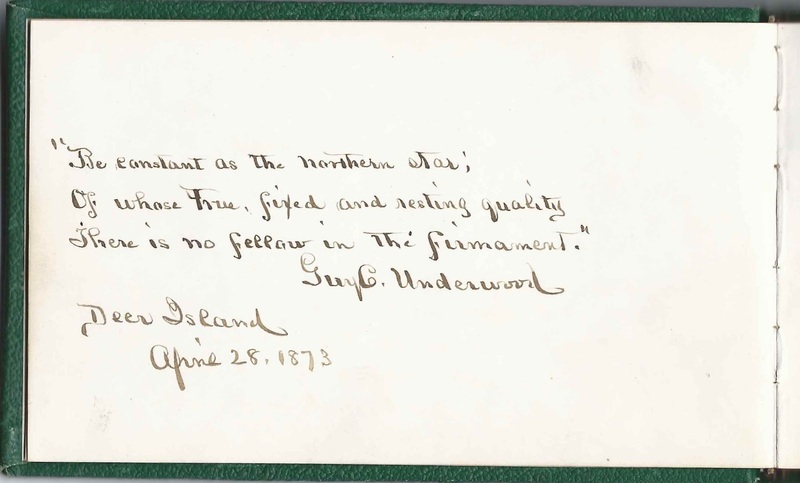 E. P. Underwood, signed at Deer Island, off Winthrop, Massachusetts, on April 26, 1873. She was Elnora Prescott Connell Underwood, wife of Guy C. Underwood, who signed the left facing page. J. Mossie Underwood of Deer Island, off Winthrop, Massachusetts, age 10; he signed on April 24, 1873. Joseph Rawson Underwood, born 23 December 1862, son of Deer Island House of Correction Superintendent Guy Carlton Underwood and wife Elnora Prescott Connell Underwood. C. H. Underwood of Deer Island, off Winthrop, Massachusetts. He was Carlton Helleson Underwood, son of Supt. Guy Carlton Underwood and Elnora Prescott Connell Underwood. Guy C. Walker of Dorchester, Massachusetts, signed on May 16, 1873. Office clerk in the Board of Charitable Institutions, Boston, Massachusetts. Alonzo S. Wallace of Bristol, Maine, signed at Deer Island, off Winthrop, Massachusetts, on April 19, 1878. Port Physician at Deer Island. John C. Whiton, signed at Deer Island, off Winthrop, Massachusetts, on October 1, 1873; shared a page with his wife and daughter. He was a clerk in the auditor's office at City Hall. Mrs. A. M. Whiton, shared a page with her husband and daughter. She was Anna Maria (Sprague) Whiton. Marion Chadwick Whiton, daughter of John C. and Anna Maria (Sprague) Whiton. She was too young to write, so presumably her mother wrote her name for her.